Hey Handsomites! Eric and Robbie are back from their break and are talking about Don Rosa and his ducks! They explore the universe of Scrooge and Donald, talk about the tradition of Carl Barks and adventure stories, and discuss the beautiful new books by Fantagraphics! They also review the past three week’s worth of comics, and talk about Witcher 3 and Mad Max: Fury Road! This entry was posted in Episodes and tagged battleworld, convergence: shazam, Don Rosa, donald duck, infinite loop, injection, modok assassin, old man logan, planet hulk, Scrooge McDuck, secret wars, thor, where monsters dwell on June 2, 2015 by Robbie Dorman. Hey Handsomites! Eric and Robbie are talking the year in comics and awarding the best (and worst) in their second annual awards show! All of that plus reviews of Shield #1 and Adventure Time #35! 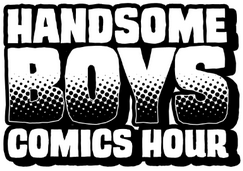 Next week in Nerd Boy Book Club – Southern Bastards by Jason Aaron & Jason Latour! This entry was posted in Episodes and tagged adventure time, capture creatures, code monkey save world, comic rack, Don Rosa, dragon age:inquistion, new avengers, robin rises alpha, Scrooge McDuck, shield on January 6, 2015 by Robbie Dorman. It’s been several years since I had this simple exchange with Don Rosa about his work. I was a very different person then and eight years younger, and to be honest, it’s a fairly inane exchange. But here’s what Don sent me. At the time, said he spent about four hours a day simply answering fan mails. Within a few days of sending this note, he replied with this. I think it reveals a lot about his character, as well as his frustration with his Disney overlords. This conversation mentions a close friend of mine, whose name has been removed to be considerate of his privacy. Eric: I also hope it was worth your while to come all the way out to our little comic con (Note: Heroes Con 2005 was much smaller than it is these days), as I know I’d certainly look forward to hopefully seeing you in person another year. This entry was posted in Extras and tagged Disney, Don Rosa, Ducktales, Scrooge McDuck on May 29, 2013 by handsomeboyscomicshour. In Episode #3, Eric and Robbie are recording…together! Hear them discuss Howard the Duck, gay kisses in Archie, the new releases of the week, our FIRST listener question and the debut of Comics are…METAL!!! This entry was posted in Episodes and tagged all star western, batman inc, booster gold, comic books, comics, daredevil, Don Rosa, handsome boys comics hour, jonah hex, metal, Scrooge McDuck, sub-atomic party girls, uncanny x-men, young avengers on May 28, 2013 by handsomeboyscomicshour.